Get maximum Omega-3 supplement benefits for your heart, body and mind. 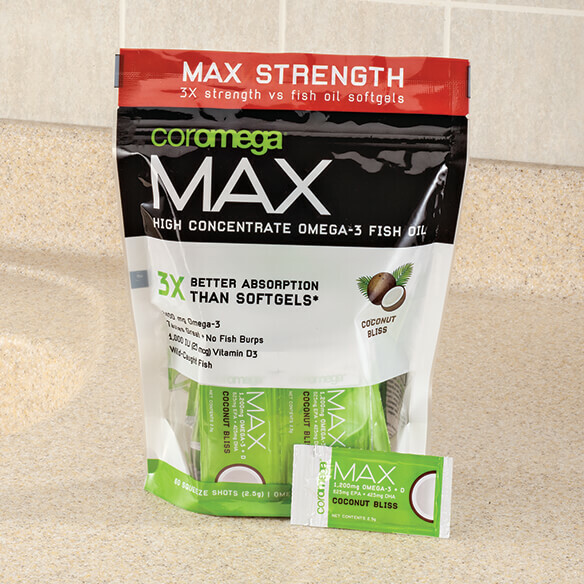 Coromega Max Omega-3 Fish Oil Coconut Bliss has a powerful 2400mg of Omega-3 fatty acids, including optimum levels of DHA + EPA. No fish burps. The easy-to-take soft packet can be squeezed directly into the mouth, onto a spoon, or added to food or drink. To use, tear along perforation and squeeze directly into mouth, onto spoon or add to food or drink. Adults and children over 4, take one or two shots daily with or without food. Formulated from certified wild caught deep water fish, in its natural triglyceride form. Meets or exceeds all government and international standards for purity and safety. (Adults and children over 4) Take one or two shots daily with or without food, or as directed by your health professional. Tear along perforation and squeeze directly into mouth, onto spoon, or add to food or drink. Do not freeze or heat. Consult your physician before taking this or any dietary supplement. Fish oil, water, pasteurized egg yolk, ascorbic acid, natural orange flavor, sodium ascorbate, natural coconut flavor, stevia leaf extract, vegetable oil, mixed natural tocopherols, citric acid, potassium sorbate, sodium benzoate, beta carotene (for color), xanthan gum, menthol, cholecalciferol.